Hi. I’m Jason Harle. Hello from Pacific Palisades, California! 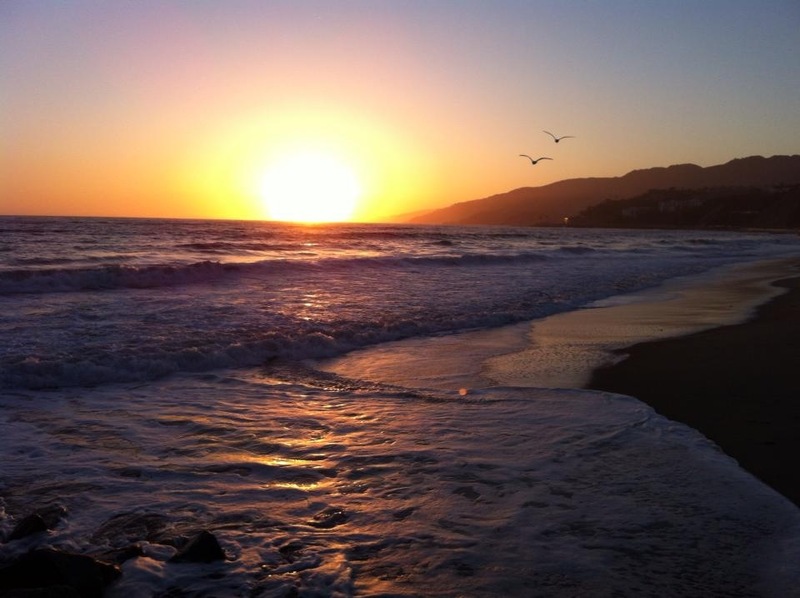 For those unfamiliar with the Pacific Palisades location (I hadn’t heard of it before moving here), it’s a northwest suburb of Los Angeles, adjacent to Malibu and Santa Monica, and nestled in between mountains on the east and the ocean on the west. It took love’s attraction, and marriage, to move my Midwestern roots to the West Coast. Earlier this year, I married the love of my life Denise Mayo, now Denise Harle, and relocated due to her place of employment. Being a smaller-town guy, and enjoying the life of open spaces and less traffic, it’s taken some time to adjust to Los Angeles. Fortunately, there are plenty of outdoor getaways, trails, and places that enable me to get out and stretch my legs! Although I wouldn’t call myself a runner, solely, as I’m a huge fan of anything exercise-related, I do actively participate in running whenever I can. 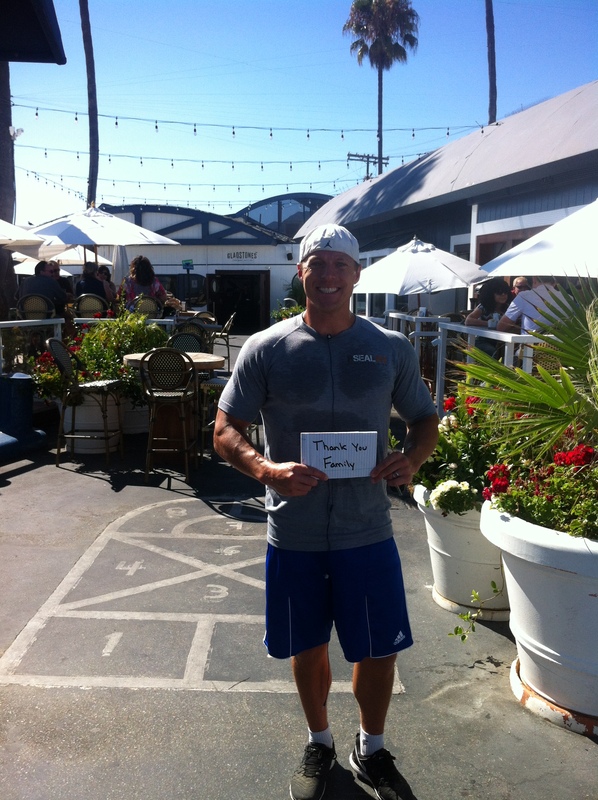 In fact, running has always played an instrumental part of my life. As a small boy, you would never find me walking, as I was always running to and fro. I guess some things never change. I actively participate in road races, even having participated in a marathon. To conclude my running resume, nearly three years ago, my friend and I started the Track and Cross Country Journal, a science-based journal about running. 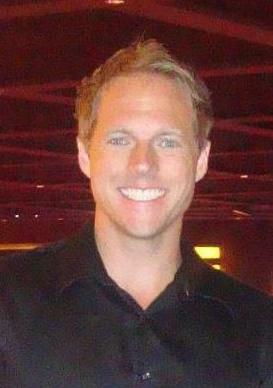 On a more personal note, in addition to the Track and Cross Country Journal, I currently teach college courses, online, at both Des Moines Area Community College and Simpson College – a job and two colleges I absolutely love. I also coach and manage my own fitness company, Farmer Gym. The route I chose to publish is a 4.7-mile venture that snakes alongside and close to Temescal Canyon and its accompanying Santa Monica Mountains, down Sunset Boulevard to the Pacific Ocean, along the beach beside the Pacific Coast Highway running toward the city, and back “home,” up a moderate incline to Sunset Boulevard. For those of you visiting the area and wishing to run this route, there are a number of road-side parking places; therefore, you are able to pick up and take off at most locations on the route. Stop one occurred approximately 1.5 miles into the run, close to the ocean. Seen and unseen in this picture are the Santa Monica Mountains, to the right, and the coastline, to the left. The Santa Monica Mountains provide a number of trails where one can “get away.” A person has several handfuls of running opportunities there, including hikes with waterfalls, beautiful wildlife, and challenging terrain, for the more expert hiker. Although snake bites are incredibly rare, pay close attention to your step when running the mountainous trails, as rattlesnakes have been spotted on some. 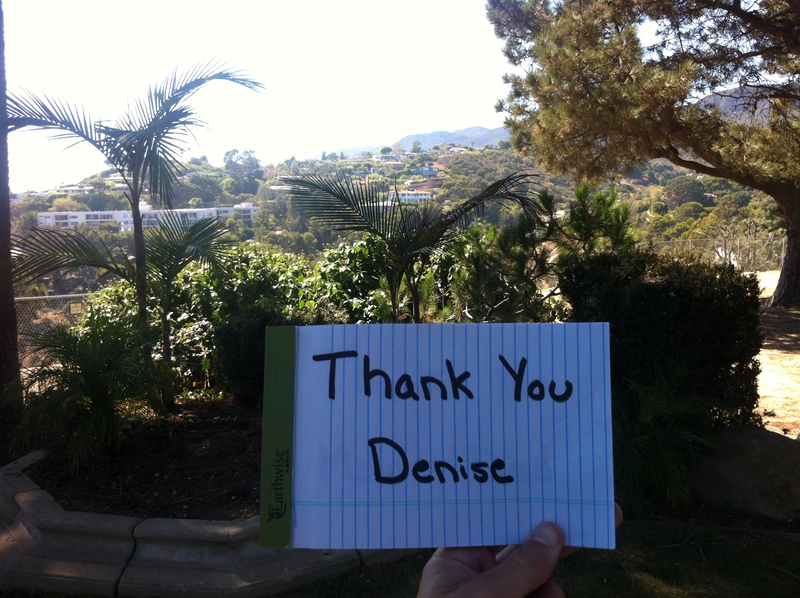 I’d like to first thank my wife, Denise. She’s my best buddy and is a pillar I can always rely on. Thank you for all you do. I love you. Stop two occurred shortly after stop one. You only have to go a few hundred feet to encounter this piece of architecture. The Lake Shrine Temple sits on a 10-acre site of land that consists of plush gardens, a spring-fed lake, and some wildlife. If flower decor isn’t your thing, this location still offers a great spot to kick back and enjoy a peaceful outdoor nap or a book. In the picture’s backdrop, you once again see the Santa Monica Mountains. Next, I’d like to thank my parents. You two are the greatest parents I could ask for; I’m certain my sister, Kristin, can attest to this. Thank you for your guidance, support, and continual love. I love you both dearly. *Note: The charity I’m supporting is the American Heart Association. Approximately three years ago my father came within days of losing his life due to heart complications. Thankfully, he is with our family today. Therefore, my donation will be to this organization. My third thank-you goes out to my family. Coming from a family that loves and supports extended family, my grandparents, aunts and uncles, and cousins have played an instrumental role in my life. Thank you all for your love and support. Now that I’m married and have another family, this thank-you goes to you, too. Thank you for bringing me in and making me your own. I look forward to many great years with you all, just as I do with my very own. The next stretch of run provided a different type of terrain. After about a half mile of running alongside the Pacific Coast Highway, I found a “path” and climbed down a rock pile onto the beach and began a mile-long journey through the sand. The beach, Will Rogers State Beach, made for a slightly more difficult run, but it was well worth it. There, you will find sunbathers, kids jumping through waves, and random games of beach volleyball. For those who haven’t run along the ocean, give it a shot; I think you’ll like it. Interesting Will Rogers State Beach fact: The TV show Baywatch was shot here, before it moved to Hawaii. 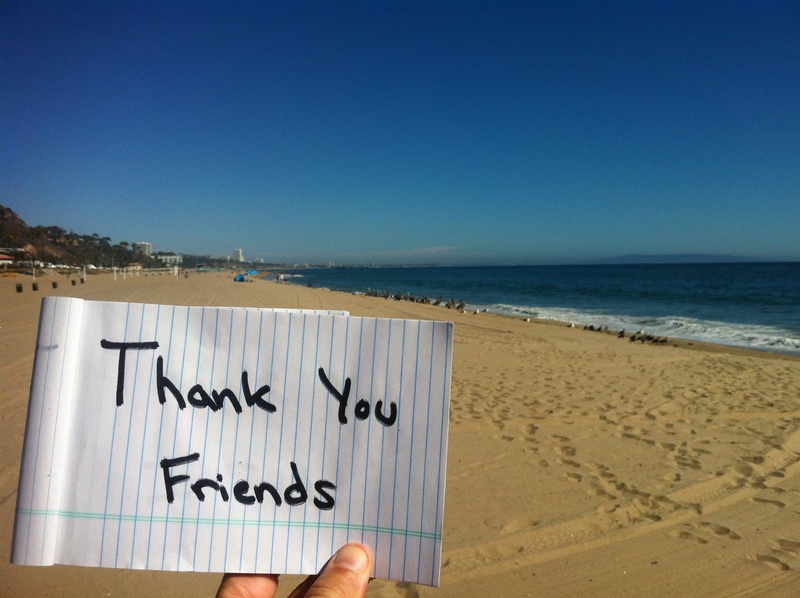 Thank-you four is for my friends. I love you all like family; in fact, I could have easily placed you under the family thank you category. I appreciate you all more than you know, and I’m truly grateful for you always being by my side. Equally, thank you for all of the fun we had / have. A special shout out goes to Katie Lickteig, one of Iowa State University’s finest. It was Katie who drew my attention to this endeavor/cause. Katie, thank you! Thank you five goes out to my alma-mater, Iowa State University. As the years pass, I can’t help but be increasingly more grateful for and proud of the university I once attended – an equal thank you and shout out goes to the Ames community, a place I loved and called home for so long. It was there, ISU and Ames that led me onto the path that I walk today. 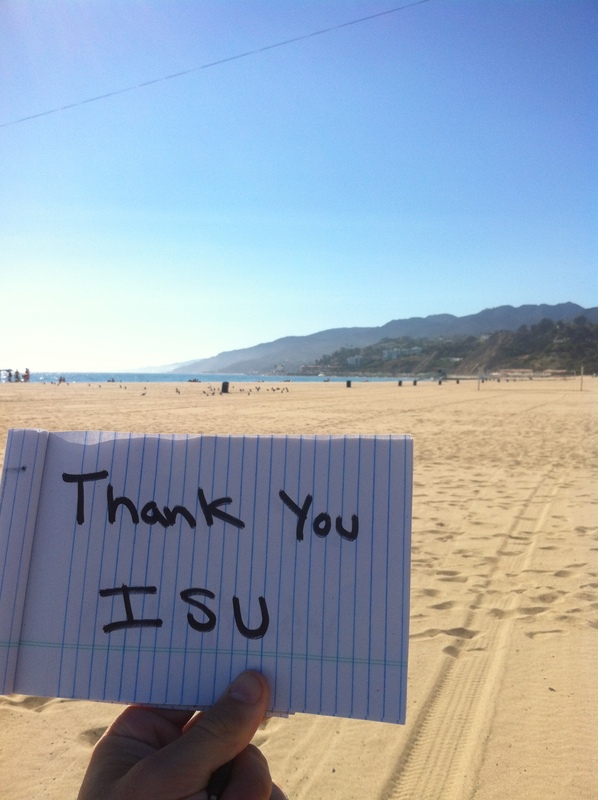 I am forever thankful to ISU. The next photo is a shot of the road sign at the bottom of Temescal Canyon Road. 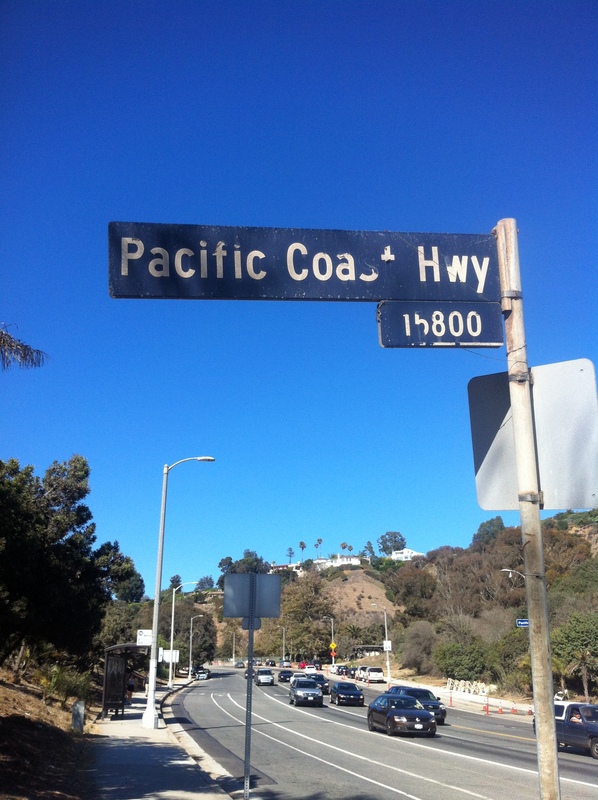 The Pacific Coast Highway sign marks the beginning of the climb to the top of the canyon, where I started the run. After a tough, mile+ ascend to the top, the run is complete. There, meeting back up with Sunset Bouldevard, my legs can rest. My final thank you goes out to everybody who has been a part of my life. I have met so many awesome people throughout my life, and each of them have a special meaning in and impact on my life. Whether it’s a former boss or a brief encounter with a particular person, I’m fortunate to have had many great people help me on this journey we call life. 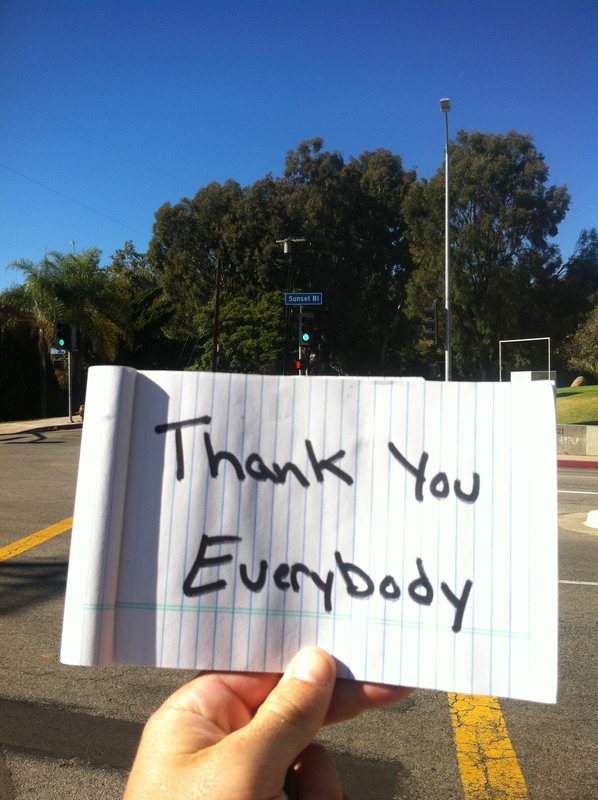 So, to all of you who have not been mentioned by name or category, thank you. This concludes my run through the Palisades, as the locals like to call it. I hope you enjoyed the run. 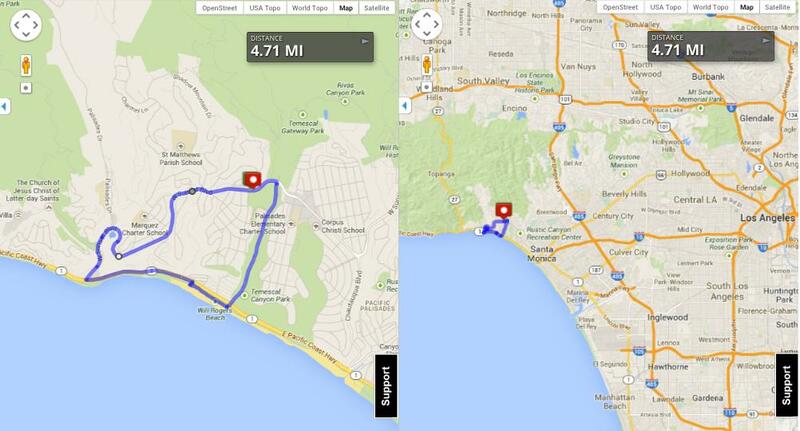 If you’re ever in the area and are looking for a running buddy, please don’t hesitate to look in my direction. I’m usually up for a run and always ready to make a new friend. Before I go, thank you to Steve Good for setting something like this up and allowing me to be a part of it!